1 How to make QA a help instead of a burden ? How to make QA a help instead of a burden ? Nothing is more annoying then when a QA check finds a problem after you thought you have finished the job long ago. As a result this means all possible QA should run ASAP and be visible immediately at a place where the developer is looking anyway. This is usually the build result, either in monitor overviews or notifications. It should also provide directly helpful information like concrete error messages, stack traces or alike to minimize the need to setup an own development system. This concept shall not invent an own QA framework but focus on integrating all possible existing ones. As a result the OBS needs to have a simple SUCCESS/ERROR (and maybe WARNING) result handling to allow to generate simple overviews, but still be able to show all kind (and possible extensive) QA framework results. This can be simple text files, but also binary files like core files or even full snapshots of a VM. More sophisticated states like "expected failure" are tried to avoid in this concept and belongs to the used QA frameworks below. test suites coming with the source. In rpm spec files the %check section should be used to run them. Manual test scenarios as described in testopia! directly after packaging => the built package has been installed into the build environment. Maybe additional packages for running the QA has been installed as well. The build tree may be still available. Network setups => multiple VM setups (either via packages or via images) need to be able to interact. Hardware specific setups => To test specific hardware support or to run benchmarks the same defined hardware systems are needed. Either to test a driver or to make benchmarks comparable. 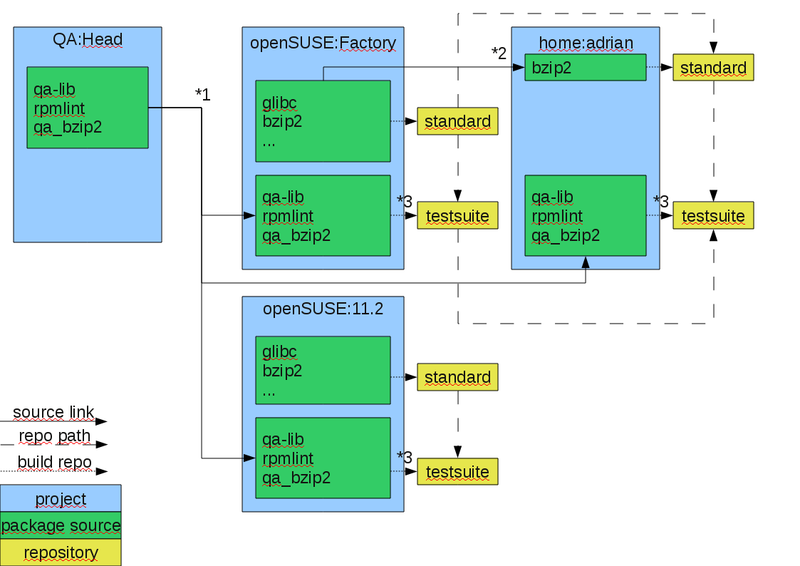 Automated test control for hardware specific setups => with hardware specific setups OBS shall handle test control when test are run in different environment - OBS needs to handle connection, test control and power supply control (e.g. to reboot and continue if test device jams with experimental kernel SW). Note: an appliance build may be handled like a package, which is executed directly after build. But is limited to appliances which can directly run in our VMs. Run for all packages in openSUSE:Factory. Some kind of admin empowerment is needed to be allowed to create such definitions. On the other hand a package or a project may pick a set of QA checks from random places. In any case the same QA checks should run by default, when a package gets derived into another place (for example branching or linking a package source). This is for testing individual package builds. We need some additional workflow for testing a product. For this example, we are using "bzip2". Do we need a .qa file? So far we think we can avoid it and just package qa checks and just run all executables in a certain directory. We may need to add one later to describe for example how to run a certain appliance and how to check it. Packaging qa checks with executable dependencies (if any) is useful so that developers can install checks to their development environment and run checks before submitting packages to build system. QA checks may come from an own dedicated package out of QA:Head project or from upstream sources from the openSUSE:* package sources. How to enable/disable package builds of project linked sources just for one repo ? Depend on repo name specification ? How to run qa checks which come with the upstream source independent of build ? Can rpmbuild skip %check ? Can we run it afterwards and avoiding %clean section ? How to handle this for deb ? How to find all qa results concerning a certain package ? Check all packages which match a certain attribute ? Check all qa builds which used any of the local packages from standard repo ? Define a directory where qa checks can export test results in any kind of format. To be transferred back to the rep server and downloadable by the api. This page was last modified on 18 July 2011, at 15:30.